A high-level Government delegation, Tamil political representatives, diaspora groups, rights activists and journalists will descend upon the Swiss canton of Geneva next week as the UN Human Rights Council’s 30th Session kicks off, with Sri Lanka high on the international human rights agenda during the two week meeting. The September session in Geneva will mark a major milestone in the internationalisation of Sri Lanka’s human rights issues with the Office of the High Commissioner for Human Rights (OHCHR) scheduled to release a report on its investigation into allegations that war crimes were committed during the island’s conflict. Now, only days before the Council meets for its 30th Session, the OHCHR report on Sri Lanka remains a closely-guarded secret. The Government of Sri Lanka is expected to receive a copy of the report only days ahead of its official release, highly placed sources said. Zeid will present the report to the Council on 30 September, by which time the report should be a public document, the sources said. The investigation spans at least a decade and is believed to have gathered evidence about major rights violations committed by both parties to the conflict – Government forces and the LTTE that was fighting for a separate state in the country’s north and east. This will be one of the key differences between the OHCHR probe and the report by the UN Panel of Experts in 2010, sources said. The report is likely to highlight LTTE atrocities since investigators have gone back to a period when the organisation was still active and blatantly flouting international laws with terrorist attacks and the recruitment and training of child soldiers. It will not contain a list of names, contrary to what has long been speculated in political circles in Colombo, since the probe is not set up to be a judicial process that will find individuals guilty. The most controversial sections of this report will centre on the final five months of the war, when a previous UN panel has estimated up to 40,000 people could have died in bloody fighting in the Northern Province. The Government of Sri Lanka has repeatedly rebuffed these numbers and demanded to see evidence of such extensive casualty figures. But the phantoms born of the last days of Sri Lanka’s war have haunted the United Nations and the global human rights community almost as much as they have plagued victims and the political leadership in Colombo. In December 2013, the wider membership of the UN was presented with a follow up plan of action to the UN Secretary General’s Internal Review Panel on UN action in Sri Lanka, more commonly known as the Charles Petrie report. The Petrie report concluded that the UN had suffered a ‘systemic failure’ during the last months of the war in Sri Lanka, citing records of meetings and reports to highlight how the UN withheld mounting civilian casualty figures. According to the internal review, UN staff in Colombo, under intense pressure from the Sri Lankan Government, had failed to report that a ‘large majority of deaths’ were caused by Government shelling, while Colombo was repeatedly denying the long range attacks. Former UN Spokesman Gordon Weiss told the BBC in 2012 that the decision to withhold casualty figures was a result of the difficulties of operating in Sri Lanka. “It was an institutional decision not to use those [casualty lists] on the basis that those could not be verified and of course they couldn’t be verified because the Government of Sri Lanka wasn’t letting us get anywhere near the war zone,” he said. The report refers to the Sri Lankan Government’s “stratagem of intimidation”, including “control of visas to sanction staff critical of the state”. As a result the review panel concludes, the UN system was dominated by a ‘culture of trade-offs’ with UN staff choosing not to speak out against the Government in order to improve humanitarian access. From the devastating revelations of the Petrie report about the final days of battle in Sri Lanka emerged the UN’s Rights Up Front initiative; directives by the Secretary General on how UN staff will respond and react in unfolding humanitarian crises across the world. The UN says the purpose of the initiative is to ensure its organisational system takes early and effective action to prevent or respond to large-scale violations of human rights or international humanitarian law. It seeks to achieve this by realising a cultural change within the UN system, so that human rights and the protection of civilians are seen as a system-wide core responsibility. It encourages staff to take a principled stance and to act with moral courage to prevent serious and large-scale violations, and pledges UN Headquarters support for those who do so. In short, the UN is seeking a systematic overhaul to ensure its mistakes in Sri Lanka in 2009 are never repeated again. The moves are controversial, because human rights have an intrinsically political dimension, UN insiders explain. To put human rights at the centre of UN operations in a country could sour relations with the host state and in worst case scenarios result in the expulsion of aid workers performing critical humanitarian functions in crisis situations. The findings of the Petrie panel appear to indicate that UN staffers in Colombo were facing just such a dilemma in the months leading up to May 2009. The final days of battle between Government troops and the LTTE unfolded much the same way the fight had begun some 26 years ago. It was controversial, brutal and messy. In September 2008, eight months before the official end of the military conflict, UN staffers pulled out of the war zone in the Northern Province after the Government refused to guarantee their safety. From that moment on, UN agencies and international reporters had to rely on unverified reports emerging from deep inside the battle zones or Government news releases to understand how the final battles were unfolding in the north. Local journalists had long since given up the chase; a few TV journalists chose to get embedded with the military while others relied on Defence Ministry propaganda to tell their stories. Four days before the war ended – on 15 May 2009 – the International Committee of the Red Cross, the only international humanitarian agency remaining in the war zone, said its staff were witnessing an “unimaginable humanitarian catastrophe”. Painstakingly, over the course of six years the fragmented story of those horrific final days inside the battle zone has emerged. UN staffers have written books, Britain’s Channel 4 has gathered and broadcast video footage pointing to large scale atrocities, and a panel of experts headed by former Indonesian State prosecutor Marzuki Darusman and appointed by UN Secretary General Ban Ki Moon in 2010 concluded that the LTTE had held hostage 330,000 civilians who were trying to flee the fighting and estimated that up to 40,000 civilians had perished in the final battles, many of these from shelling by Government troops. The accounts were reflected in the stories of survivors who continued to live in the former war zone and those that had fled Sri Lanka for political asylum in other countries. In Colombo and other parts of southern Sri Lanka, the narrative was starkly different. Led by President Mahinda Rajapaksa’s administration, Sri Lanka’s south refused to acknowledge any wrongdoing on the part of Government troops or officials commanding troops in the final months of battle. At best, the shadowy accounts of major abuses and indiscriminate shelling by Government forces were chalked up to the fog of war or fabricated evidence cited by the LTTE ‘rump’ still active across Europe and parts of North America. In both presidential and parliamentary elections held this year, the UNP-led coalition steered clear of the thorny issue of war crimes while stressing the need for post-conflict reconciliation. Since January 2015 the new Government has made substantial strides in building trust between long-divided communities, the return of military acquired land in the north and east and trying to reach consensus with Tamil political representatives. Much more is left undone but these small steps have won the new Government accolades from important sections of the international community, including Washington, ensuring that eight months after Rajapaksa’s defeat and the dismantling of his carefully-constructed security state, Colombo faces off in Geneva this month against a much friendlier international community. Foreign Minister Mangala Samaraweera who arrives in Geneva over the weekend will address the Council on its opening day next Monday (14). 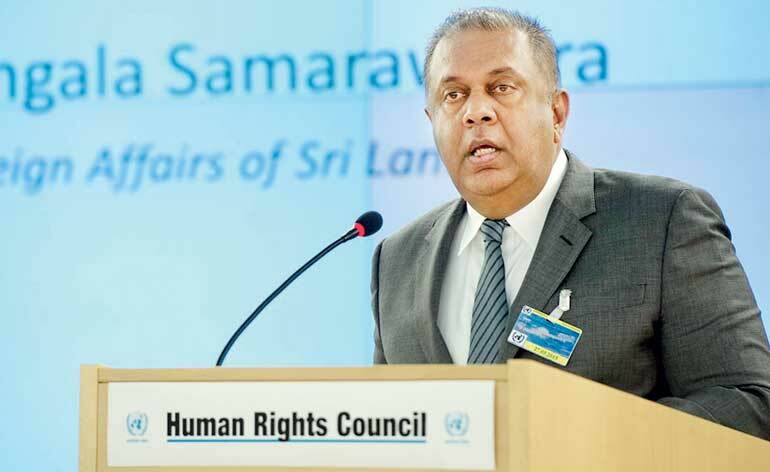 In his speech at the High Level Segment of the session, Minister Samaraweera will outline his Government’s plans for reconciliation and a home-grown judicial mechanism to prosecute those accused of major abuses or violations seen to be in breach of international humanitarian law (IHL). The three-pronged approach to lingering issues of reconciliation and accountability in post-war Sri Lanka is expected to include a permanent office of missing persons, a South African style Truth Commission and a Special Prosecutor to try cases pertaining to violations of IHL. The appointment of a special prosecutor to conduct trials would mean that the cases will not be filed by the Attorney General's Department as per usual practice since they could involve past or serving Government officials or military personnel. The Government is expected to move relatively quickly on the TRC and the permanent office to deal with disappearances, but the establishment of a special prosecutor's office is expected to take longer, highly placed Government sources told Daily FT. The mechanism for special prosecutions will require the enactment of an entirely new set of laws by Parliament before the plans can be actioned. The domestic mechanism will have technical assistance from the UN through the OHCHR to fulfill international standards and ensure credibility for the process. Tamil National Alliance representatives who will fly to Geneva next week will seek to lobby foreign delegations at the UN to include a larger international component into the domestic mechanism to try the controversial cases. The resolution on Sri Lanka, which will be tabled towards the end of the UNHRC session this month, is widely expected to endorse this Government blueprint for accountability and reconciliation. The resolution is unlikely to impose a deadline on the process, but could ensure it is periodically reviewed by the Council at future sessions. The draft resolution will not be contested by the Government of Sri Lanka and is likely to be adopted without a vote at the Council. “The fact that the Government of Sri Lanka is now cooperating and engaging with the international community and the UN is something that will have to be taken into account,” highly-placed diplomatic sources said. Eight months ago, the picture of international action on Sri Lanka’s human rights record was entirely different, these sources said. Faced with the Rajapaksa administration’s obdurate positions on human rights issues and its worsening rights record, there was clarity and unanimity in terms of how to proceed among all stakeholders – international rights watchdogs, Sri Lankan civil society activists, Tamil lobby groups, the UN and powerful sections of the international community – then strongly backing an international solution. According to UN insiders, the positions of all these stakeholders are now beginning to evolve and diverge. “Civil society activists in Sri Lanka want to acknowledge changes on the ground and keep pressure up to get the Government to do more; Tamil groups and rights groups will continue to insist on an international judicial mechanism or at least international oversight. Powerful states and power blocs will support the Government for making progress on reconciliation after six years of almost nothing,” the sources explained. The United Nations, meanwhile will begin to act in its more traditional role, providing middle ground and engaging and working with Sri Lanka on human rights issues. Having accepted culpability in allowing the humanitarian tragedy to unfold unreported in Sri Lanka in 2009, the UN will continue to remain invested in how Sri Lanka deals with its painful past, even if individual member states tend to move on. All this international power-play and foreign relations stratagems unfortunately tend to ignore key stakeholders in the efforts to foster accountability in post-war Sri Lanka: The victims. Civil society representatives interacting with victim families in the north this week found them to be ‘distraught’ and feeling let down by rights groups and the international community. Looking for answers for six long years, these families are now convinced that compromise will be reached in Geneva, effectively lifting the pressure on the Sri Lankan Government, and putting their cases at the mercy of an entirely domestic-driven process. After years of domestic systems failing these victims, faith in local judicial processes remain weak. The Government will find building trust in its domestic process for victims in Sri Lanka to be an uphill task. But if it is to undertake a credible process of accountability that puts justice for victims at its core, trust-building through broad consultations and honest efforts will be key. Minister Samaraweera is a liberal at heart, but other sections of the Government, including Prime Minister Ranil Wickremesinghe, tend to perceive Sri Lanka’s international human rights struggles purely as a result of inefficient handling of the country’s foreign relations. According to this strategy, re-engagement and cooperation with the US and the EU, who were the main protagonists of international action on Sri Lanka at the UNHRC will take the heat off sufficiently in Geneva and allow the Government to advance reconciliation at its own pace. With reconciliation efforts firmly underway, the Government will hope that calls for accountability will gradually fade. This is sound strategy from a foreign policy perspective and it certainly appears to be working. The international community, led by Washington, so relieved to be dealing with a less-hostile Government in Colombo, appears willing to give the new regime all the time and space it needs to work on reconciliation. Lest its efforts in Geneva be perceived purely as an attempt to root out President Rajapaksa’s authoritarian rule or make his administration increasingly uncomfortable on the world stage, the international community will continue to keep Sri Lanka on the radar, but this attention will be muted greatly as the months wear on. All the more reason then for the agitation for answers to long-lingering questions about the final phase of the war in 2009 to come from within the country. The internationalisation of Sri Lanka’s struggle with human rights was never the best way to deal with what is intrinsically an internal problem, specifically relating to how the State treats and upholds the rights of its own citizens. 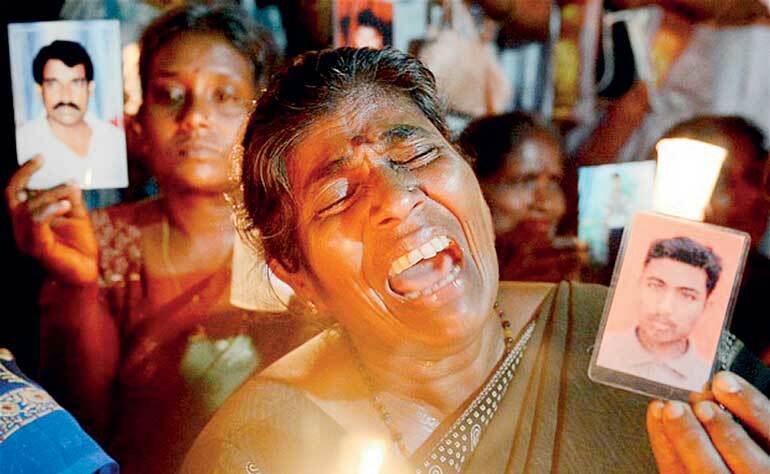 The issue of ‘war crimes’ is still highly controversial in southern Sri Lanka. Public appetite for a frank look back at what transpired in the final days of battle still seems weak, and the new political leadership has done little to alter that mindset. It is easier to accuse the LTTE of using civilians as human shields rather than acknowledge that the State actor, a legitimate Government obligated to protect its citizens, had potentially fired at that shield in an effort to root out Tiger cadres. War is ugly. It is unpleasant to talk about. It is easier to enjoy the dividends of peace than to think too much about how brutally it was won. The defeat of the LTTE brought relief across the island, especially perhaps to those people they claimed to represent who had suffered under its yoke for decades. This is undeniable. But since two wrongs do not make a right, reparation must be made for mistakes made, either by accident or design. These conversations are neither popular nor easy. But it is the new Government’s ability to alter perceptions and begin a discourse on the most difficult aspects of Sri Lanka’s conflict history that will determine if it can usher in real change. President Maithripala Sirisena, whose words and actions on reconciliation have the greatest potential to quell the fires of both Sinhala and Tamil nationalism, is perhaps best placed to begin the discussion. This was his promise, a promise of a new country. This new country cannot be crafted if one section of its people are still begging for justice, if their war-wounds are still festering and raw. As the international pressure begins to lift in Geneva and the Government rejoices in its foreign relations victory, perhaps the moment for introspection is now. The fight for human rights and accountability in Sri Lanka was much more than just a diplomatic battle. After the country waged war against itself for three bloody decades, it always was, and continues to be a battle to reclaim Sri Lanka's soul.